iTunes should be smart enough to know when an internet connection isn’t necessary. But it isn’t. It’s no secret that the iTunes Store is so tightly integrated into the iTunes application that it’s almost as though they were Siamese twins. As your local copy of iTunes has become increasingly linked to Apple’s cloud, it has become dependent on internet access. But what if you don’t have internet access? Your connection is down; or your router is broken; or you simply don’t want your computer to connect to the internet? Well, iTunes will remind you of this, over and over and over. In such a case, iTunes will pop up an alert every single time you play a song and every time one song finishes and another one begins. If you don’t have network access, you’ll see this dialog whenever you try to play anything. Over and over and over. You may think you’re clever and try to deactivate the many iTunes features that connect to the iTunes Store. In iTunes’ preferences, there are a number of such options. On the Downloads pane, there is Always check for available downloads. If you turn that off, you still see the alert. On the Store page is an option to Share details about your library with Apple. Uncheck that; no change. 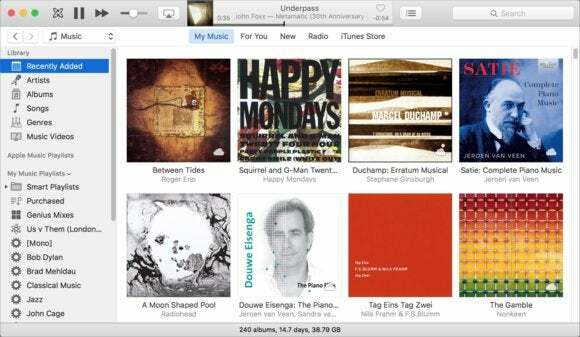 Why not try the Restrictions pane, to fully block access to the iTunes Store? No dice; you still see the irksome dialog. How about the nuclear option? Sign out of the iTunes Store. Surely that should work. Nope. You may wonder, “Well, why is this a problem? I’m always connected to the internet.” Some people may work in businesses or administrations where connections to the iTunes Store are blocked. Other people may choose to work without an internet connection; I know a number of writers who do this to avoid sapping their productivity with needless web searches and other ways of procrastinating. Or what if you’re on a train or plane, and either don’t have Wi-Fi or don’t want to pay for it? This is just another of those sloppy bugs that could be discovered with more thorough testing. It’s annoying to many people who don’t always have network access, and it should be easy to fix. The second solution is to downgrade to the previous version of iTunes. This is something I don’t recommend, because it can cause problems. When you update iTunes, more than just the application is updated. And that dialog? If you don’t have an internet connection and listen to music for a while, then want to do something in iTunes—such as choose a new album or playlist to listen to—you’ll need to click OK for every instance of the dialog. One for every track you’ve listened to. They just pile up. This is just another of those sloppy bugs that could be discovered with more thorough testing. It’s annoying to many people who don’t always have internet access, and it should be easy to fix. But it raises an interesting question: Why does iTunes have to connect to the iTunes Store every time you want to play a track?